Budget season is about to begin for many companies. I’ve spent a few decades doing research into – as well as thinking and writing about – the planning and budgeting processes in corporations. I’ve closely examined the role of the Financial Planning and Analysis (FP&A) group, which is usually charged with managing the corporate budget process. 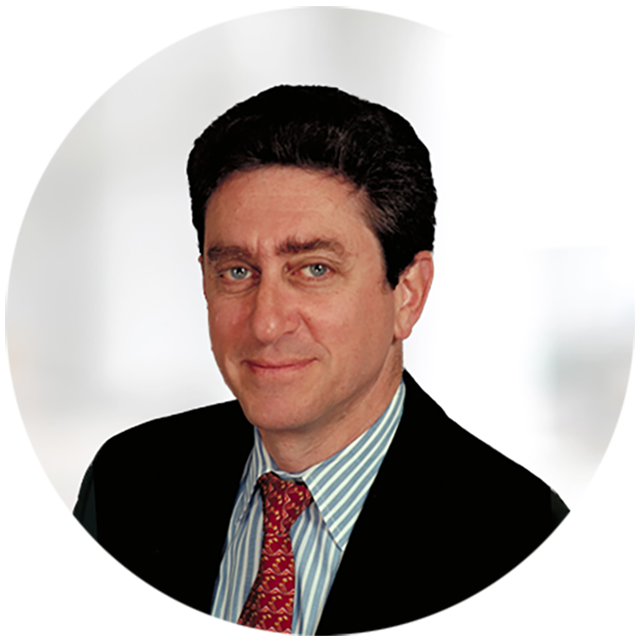 About seven years ago, I published a research note, “Putting the ‘A’ Back in FP&A”. In it I made the point that the time saved by using dedicated planning and budgeting software and therefore not having to deal with spreadsheet machinations would enable people working in FP&A to do what they were hired to do: Analysis. For as long as I can remember people have been complaining about their company’s budgeting process. Our Next-Generation Business Planning benchmark research finds that fewer than half of participants said their company performs its budgeting and planning processes well. On the surface this is puzzling because technology has made the mechanics of planning and budgeting more efficient. Yet one of the consistent complaints from budget owners is that the process provides little value to them. In their eyes, there’s a long list of things that are wrong. Almost two-thirds of those participating in our research say that it takes too long. Almost half say it’s not adaptable or flexible enough, that it’s too political and in the end, it’s senior management’s budget or the finance department’s budget. Lately, I’ve been thinking more broadly about the mission of the group, looking at it from an outside-in perspective. Another important benefit that companies can gain from switching from desktop spreadsheets to a dedicated planning and budgeting application is making planning and budgeting more useful for the budget owner. Beyond FP&A’s traditional roles as the corporate middle-manager tasked with executing the budget process and providing financial and management data and analyses to the company, the group’s mission ought to be about serving the budget owner. That is, having planning and budgeting processes that create business value for the budget owner and senior executive as well. The current state of corporate budgeting and planning reminds me of the early days of sales force automation. In the 1990s, SFA was sold as a way to help sales representatives. However, sales people initially resisted it because, in reality, SFA was used mostly as a sales administration tool. Sales reps weren't pleased with having to use their time just to appear more accountable. Similarly, the budgeting process used in most companies provides limited value to the budget owners but holds them responsible for outcomes. Even when companies adopt dedicated planning and budgeting software, the budget owners and others outside of the finance department who are involved in the process often still aren’t happy. That’s mainly because technology hasn’t increased the business value of budgeting, especially to the budget owners and executives who manage them. Technology helps the CFO and financial planning and analysis organization create planning models, produce a detailed budget and analyze “the numbers” with less effort than was required in the past. That’s important but it isn’t enough to increase the business value of budgeting. To make budgeting more valuable, FP&A organizations also need to model and measure the “things,” or resources, that budget owners use to achieve their business objectives, not just recoup their monetary value. When budget owners plan and budget, they usually think in terms of the things they need to run their part of the business, such as headcount, advertising campaigns, facilities, laptops and other items. The budgeting system must be able to simultaneously translate this list of resources into accounting line items so the system can aggregate the financial data into a company-wide budget and financial forecast. Starting with a list of resources simplifies the process for budget owners. It’s a user-friendly approach to budgeting. It lets budget owners think the way they do about their business – focusing on the things they need – but also enables them to quickly and accurately translate that list into a financial budget to address the needs of the finance department. It’s a simple idea, but it takes technology – the right technology – to make it feasible. Headcount is a good example of how this works. Say a department head plans to keep his or her existing personnel but adds a couple more during the year to meet the growth plan outlined by the senior leadership team. Rather than scratching around for the right number, the department head builds a headcount plan from the list of existing employees. The budget owner connects this list to the related cost data, such as salaries and benefit costs, and then adds two other hires in generic roles. Pay and benefit data supplied by human resources instantly turns that headcount plan into a headcount budget. So, when it comes time to negotiate the department’s budget, the discussion isn’t about abstract numbers in a spreadsheet, it’s about whether the department needs to add people to handle the increased workload or if it can get by without adding one of those positions – or if it could wait until late in the year to add that individual. The travel budget offers another example. The discussion about this allocation shouldn’t just be about the cost, it should be about the number of business trips. Is the number too low or too high to achieve the department’s business objectives? Or in the case of marketing, a results-focused discussion should be about how many leads are needed to achieve sales objectives and how much these will cost – not just the cost. Creating budgets and plans expressed as things, not just money, also means that as the year progresses, the FP&A group will be able to analyze whether variances were the result of the things that were different or if the costs were different. In other words, it will highlight whether the headcount expense variance is the result of higher-than-expected benefits expenses or because the number of employees is different than was outlined. This approach can speed up the budget process and focuses the discussion in budgets and reviews on business issues and objectives, not just the financial plan. Rather than requiring budget owners to tediously construct a fiscal budget for each of the line items, it is more productive to have them focus on their business objectives and then plan the resources required to achieve them. Unfortunately, our Next-Generation Business Planning research finds that two-thirds (65%) of companies use spreadsheets for budgeting. Dedicated planning and budgeting software can be designed to translate all the required resources into budget line items. This isn’t feasible using desktop spreadsheets for three reasons. One is that spreadsheets are two-dimensional grids that are well suited for working with accounting data but as a practical matter can’t work with things. Second, the process of aggregating data from multiple business units is too time consuming to be feasible. Third, it’s too difficult to control access to sensitive information such as salary and headcount costs. When budget owners plan the things that they need to achieve their business objectives while translating those things into the budget, the finance department promotes a collaborative approach to planning and budgeting. Collaboration is essential for effective corporate planning and budgeting because the process of planning in corporations ought to get everyone onto the same page to ensure that activities are coordinated. Our research finds that almost all companies that collaborate effectively in their planning processes have a process that’s well managed. 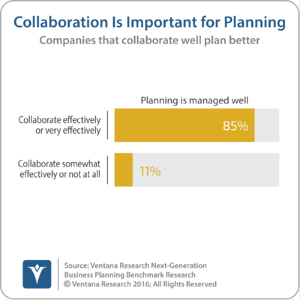 In contrast, just 11 percent of companies that don’t collaborate effectively have a well-managed process. Planning the resources needed to achieve business objectives and the budget necessary to have these resources in parallel increases the business value of the process. It shifts the discussion between executives and budget owners away from abstract financial numbers and back to the things the budget owners need to achieve their objectives. It delineates the things that the budget owner can control from the things he or she doesn’t. For example, having the budget show resource requirements as well as costs focuses budget discussions on business issues, not just spending caps. Questions arise such as, what’s the rationale behind cutting the department’s budget? Is it asking for too many people relative to the work that needs to be done? Are the corporate allocations higher than they should be? Are travel costs increasing faster than the value of an additional sales call? Budget discussions about how best to adapt to spending constraints should focus on objectives and the resources need to achieve them – not just abstract accounting numbers. The numbers are the guardrails but plans that focus on “things” as well as finances also make performance assessments more insightful and useful. For example, if headcount costs turn out to be materially different than planned, a financially focused budget cannot easily determine if the difference was due to a misestimation of labor unit or benefit costs, a different mix of pay grades employed or some combination of the three. Planning and tracking things provides FP&A, budget owners and executives deeper insight into performance than numbers alone. Even if the actuals are in line with the budget, this might be the result of one factor temporarily cancelling out another, obscuring the need to revise estimates in future periods. Software that’s designed to plan the things a business needs as well as their budgetary impact is better able to quickly compare actual results to the plan in parallel with the budget. Increasing the business value of budgeting and planning for budget owners and executives should be a priority for FP&A organizations. Unfortunately, our Next-Generation Business Planning research finds that two-thirds of companies use spreadsheets to manage their budgeting process. As noted, desktop spreadsheets have inherent deficiencies that make them unsuitable for the kind of budget owner-friendly budgeting outlined here. Dedicated planning and budgeting software is the right tool for the job. Dedicated software also can provide guidance during the planning and budgeting process as well as useful feedback as the planning period unfolds. It can do so using “things” (headcount, throughput, consumption) as well as money (budget accuracy, profitability) and KPIs (input-output ratios, not just money). Financial planning and analysis leaders who want to take their organization to the next level should begin to think about the process from the outside in. Putting the A back into FP&A is a good first step but to increase the department’s strategic value, it’s necessary to make planning and budgeting a more useful tool for the business. Companies using dedicated software for budgeting and planning should examine how the software they use can better serve budget owners. 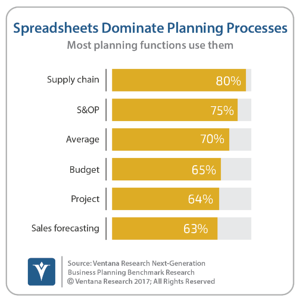 Those using desktop spreadsheets to manage the budgeting process should move to a dedicated planning solution to make the FP&A organization more productive. And dedicated software, not spreadsheets, is capable of making the process a more useful business tool for budget owners and executives.